Four succeeding generations of Waynes owned Waynesborough. Anthony’s son, Isaac (1772-1852), and his wife, Elizabeth Smith, survived all of their five children. Waynesborough then passed to the grandson of Isaac’s sister, Margaretta, William Wayne Evans (1828-1901), who upon the death of his father changed his name to William Evans Wayne to perpetuate the Wayne name at Waynesborough. 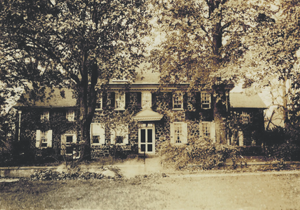 The son of William Evans Wayne and Hannah Zook, William II (1855-1929), married Mary Valentine Fox, and their son, William III (1884-1969), was the last direct descendant to own Waynesborough. This entry was posted on February 24, 2013 by Graphica in Archival, Building, Exterior, House and tagged Anthony Wayne, Antique Photos, Historic Waynesborough.